I know some of you thought my latest assignment about hometown history might be a little too much like a school report. When I was in school, I would have agreed. Today, we have the Internet, Google and Wikipedia which make finding historical information about the places we live in very easy. Of course, you could always walk around and hope to run into history as I did one day in my hometown of Baldwinsville, New York. 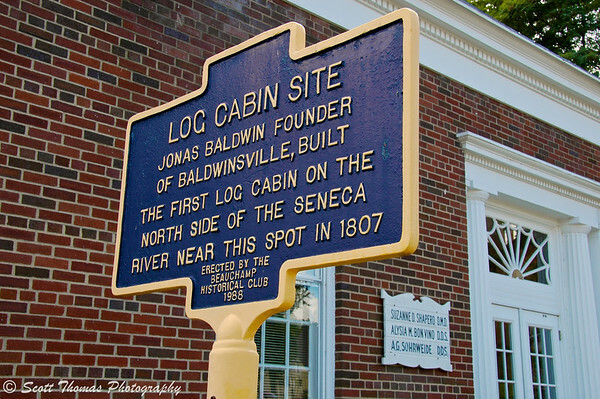 An historical marker of the log cabin site of the founder of Baldwinsville, New York, Jonas Baldwin. Nikon D70/18-200VR, 1/80s, f/11, ISO 200, EV -0.3, 32mm focal length. Dr. Jonas Baldwin was a very industrious sort. He saw opportunity around the Seneca River and the location which would come to bear his name 41 years after building his cabin. He built a dam to harness the power of the river, a canal to create easy passage of boats past the dam rapids and a bridge across the river to open up the north-south corridor. As interesting as Dr. Baldwin was. The building behind the historical marker you see in the photo above has some history too. History I could not find on the Internet (though it is probably out there). This history comes directly from me. As I was growing up, the building was Baldwinsville’s United States Post Office. It had a high rounded ceiling inside which amplified any sound in the lobby whether it was a person’s voice or shoes on the hard flooring. It called for whispers when talking so as not to disturb anyone. It was replaced by a boring modern Post Office in the early 1980’s about a mile from this location. Today, I still visit the old Post Office for my dental checkups as it is now a dentist office. However, the old lobby is now a series of offices with none of the charm or sounds I remembered from my childhood. See how easy it is to find history about your hometown and go out and photograph it? Looking forward to your submissions! This entry was posted in Travel and tagged 18-200mm vr, baldwinsville, brick, building, historical, history, jonas baldwin, new york, nikon D70, post office, sign, united states. Bookmark the permalink. Interesting picture and part of history from a personal perspective. I like that. I hope to hear some of your hometown’s history the same way, Isa. I like the eyewitness (and earwitness 🙂 ) testimony too! There is an astonishing amount of twaddle on the internet about history, but I did find a nugget that sounds like it might be right. That Post Office you remember was possibly a WPA project. Now THAT is an interesting subject in itself. OK, I’ll be quiet now. Well, you turned up something I tried to find. I did located an old book about Baldwinsville with all kinds of photos from the village’s past. I really like seeing old photos and comparing them to what is the present. I like the personal recollections! Thanks, Terry. Whether people have lived there all their life or not, a place holds not only it’s only history, but one’s own personal history associated with the place. So I’m not completely sure, are you looking for places of “actual” history or “personal” history or is any type okay? If the rain doesn’t go away soon, I could need an extension! Any type is okay with me, Karen. Whatever you would like to show us. Hang in there. This weekend’s weather is looking promising. We just celebrated our 200th birthday here, the history of my town is long and eventful, just wish I had to time to put it together for a post, too many Senior Portraits piling up on me, I love the idea though !!! Work must come first. Was wondering how your studio was working out. Stay busy! It has been raining here also, but I’m hoping to be able to go out and look around. I need to ask my co-workers that live here all their lives, I’m sure they’ll have some interesting stories. Good idea, Nye. Locals know the cool stuff about a place’s history. Real or imagined. Yeah for technology. I can be so frustrating when it is down. Great, I do like it when I inspire people. Looking forward to what you come up with, Truels.